On top of being an outstanding equestrian, Lisa Walters is also an author and Equine Assisted Learning professional. 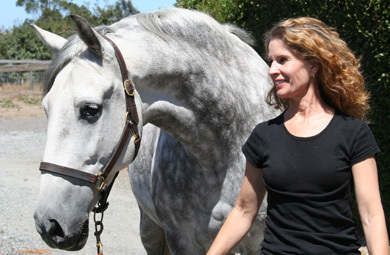 Lisa has initiated academic research projects regarding the energy that flows among horses in a herd and between horses and humans when they connect. She kindly accepted an interview with me about her findings. 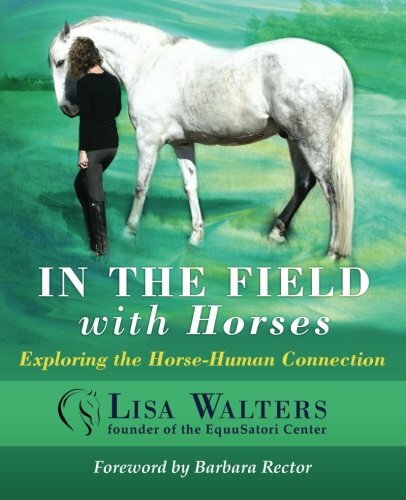 Lisa, the subtitle to your book ‘In the Field with Horses’ is the phrase ‘Awaken to the Energetics of Horses.’ What does ‘energetics of horses’ mean? Horses are continuously responding to and interacting with what they sense and feel around them. 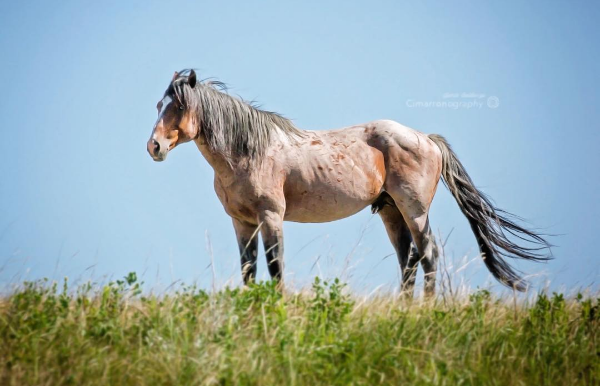 The horse’s ability to sense subtle energy and their ability to stay present, enables them to tune in to a more heightened and expanded awareness.This is a skill they likely developed to survive in the wild as relatively defenseless animals. The energy between members of a herd moves like a ripple in a pond. Imagine a herd relaxed and grazing in a field. At some point one horse senses a change in the energy field — maybe foreign waves he can’t place, or an unfamiliar sound. Since horses don’t have language like we do, their way is to demonstrate what they’re feeling, to act it out. It’s a bit like charades. Their energy and subsequent actions will reflect how concerned they are, based on what they are sensing in the “field.” The concerned horse will not only look in the direction of what it’s concerned about, it will send an energetic shockwave of fear through the herd, like large ripples in a pond. When the others “feel the fear” of their herd mate, they won’t ask themselves whether it’s their own fear or someone else’s. They’ll feel it and act accordingly. How can you be sure that they read the energy field, and they don’t simply react to hearing sounds, sensing smells and seeing moving objects? Apart from hundreds of years of anecdotal accounts in the equestrian world, my colleague Dr. Ann Baldwin and I have studied the interconnectedness between horses and humans by looking at “coherence markers” in both the horse and the human during specific interactions commonly used in EAL sessions. What has been revealed is proof that the electromagnetic energy fields (that emit from every beating heart) have effects in relationships between horses and humans. 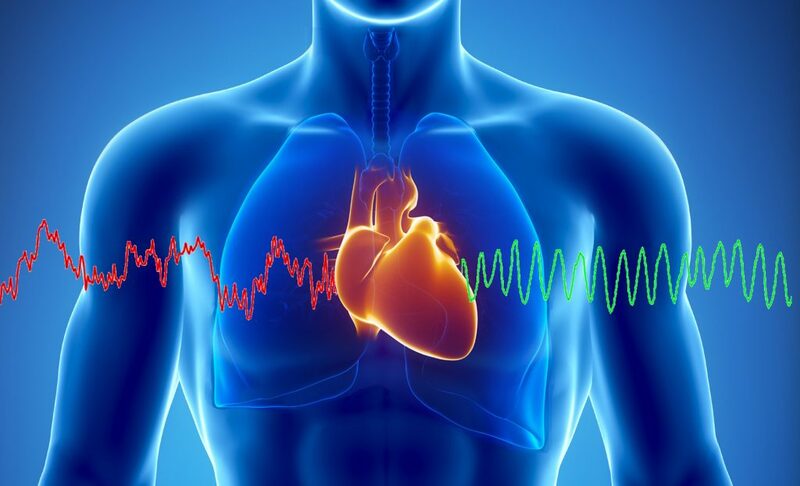 Scientist all over the world, and in particular at the HeartMath Institute in Boulder Creek CA, have discovered that the electromagnetic energy fields being emitted by our heart organs are influencing each other all the time. These electromagnetic signals are 5,000 times stronger than those emitted by the brain. Their research has shown that the heart’s electromagnetic field can also affect the brainwave frequencies of another person. Before you go more in depth, let me take a step back to my research question about performers on stage. These electromagnetic signals are potentially a revolutionary revelation for performers. It sounds like not only they can share sounds, colors, symbols (and to a deeper extent, smells, flavors and tactile elements) with their audiences, but they are already — be they aware of it or not — sharing and receiving strong electromagnetic waves with the power of affecting brainwave frequencies of others! Exactly. They have found that when the beat-to-beat changes between heartbeats smooth out, we enter a psycho-physiological balance between brainwaves and heart rate variability state called Coherence. When we are in a state of coherence, our brain waves come in phase with our heart, our sympathetic nervous system settles down and our parasympathetic system comes online, causing us to be in a peak performance state. To the left, incoherent waves; to the right, coherent ones. So how do horses fit in the picture? Our studies have shown that horses stay in a coherent state most of the time. When they spook or run, they go out of coherence, but they’re quick to go back into it once the perceived danger is no longer a threat. What we’ve also seen in the data is that when we engage with the horses in a mindful way, their heart-field influences humans by increasing the VLFs (Very Low Frequency range on the coherence spectrum). An increase in VLFs are associated with healing PTSD and other stress and hormone disorders. This may be why many of the EAP and EAT (Equine Assisted Psychotherapy and Equine Assisted Therapy) programs are seeing such positive results. In our research, we saw the most synchronized energetic resonance between horse and human when the human directed feelings of appreciation (different from thinking about appreciation) to the horse.We used a HeartMath technique called the “heart lock-in” to do this. Each time the person in the same arena with a loose horse began sending thoughts and feelings of appreciation to the horse, the horse looked directly at that person. This happened even when the horse was 20 or more feet away. The corresponding data showed the humans coherence increase during this process. And we saw the most synchronization between the horse’s and the human’s heart rate variability. In my everyday interactions with horses at liberty, I have found that when people approach the horse in a state of greater presence (with open mind and heart), the horse is more interested and willing to connect and cooperate with them. Conversely, if the person is present in a physical sense, but inside is agitated or afraid, the horse will not want to engage and may even move away. Working with horses at liberty calls for us to be congruent in body, mind and spirit. If a person can add coherence to the mix – it’s all the better. 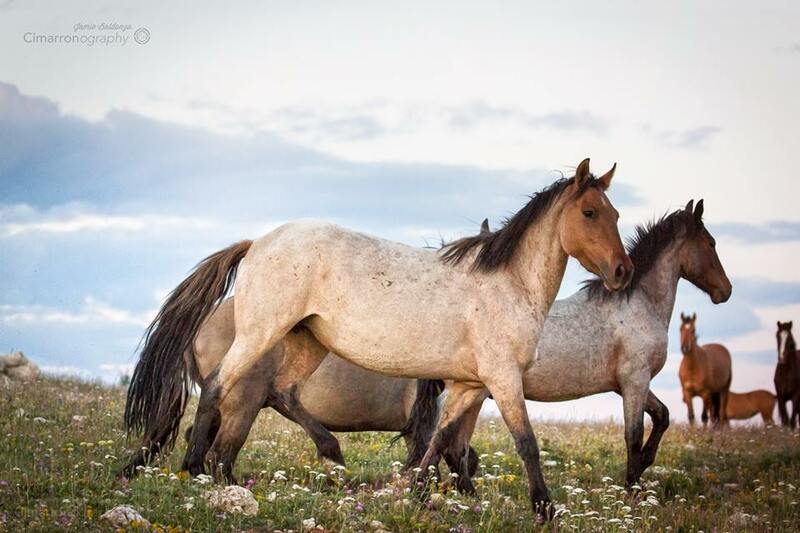 It sounds like the horses would acknowledge the human as a safe or interesting being to connect with, only when the human was coherent. So we’ve seen how a horse’s energy field has an influence on a human, but it can work the other way around as well? Yes. If we are with horses and one of them gets excited, we can learn to act energetically like a lead horse and not buy into the excited horse’s agitation. Eventually, the agitated horse will calm down and follow suit. As horse professionals, we learn to do this on a regular basis. Our own nervous system is not designed to be at the high stress levels that we tend to operate at these days. Humans will naturally move in and out of coherence throughout the day and night. We can be taught to generate more coherence with simple techniques and practice. Learning to connect with horses, in order to practice alignment between our head and heart, with intention, is a powerful and effective way to hone these skills. In addition to providing a non-judgmental platform for us to practice these skills, horses beat the drum of coherence for us to resonate with. The more we mindfully connect with them, the more we see their presence affecting our nervous systems. I believe this holds true with everyone and all forms of life. They are unfailing mirrors of our emotional state (indirect influence). Yes and no. It’s not quite black and white. Let me use music as a metaphor. The horses are hitting the note of coherence pretty much all the time. It would be like one violinist playing the D string. All other string instruments in the room that are sitting quiet, would have detectable levels of their own D string vibrate. If all the players of those instruments also “hear” the D note and decide to play it at the same time, one could say, they have allowed themselves to be influenced and tuned to D.
So as far as the direct influence is concerned, you will not see horses influence people who are not open-minded and intending to connect with them. Or in many cases, the respondents won’t be aware enough to recognize that the influence is happening. The main point here is that it’s not only about being in the presence of horses, but also about learning to connect at the energetic level. With a properly facilitated EAL session, people can learn to do this. You can learn coherence and presence without a horse, but the opportunity provided in working with a horse is learning how to maintain these states in relationship. Which in the case of performers, we can translate into the following: you can learn to reach your peak performance state in a number of ways, and a good way to practice maintaining it in a dynamic situation involving other beings (such as a performance), is to practice with horses. When you are in a state of coherence, you will be more resilient. Your subtle awareness expands, you feel more, you are able to move more effortlessly, without overthinking. Interactions seem to flow more effortlessly into spontaneous right action. When we are able to recover quickly from stress states, we call this resilience. With more resilience, we are able to have less attachment, because we have a broader perspective. This enables us to be more present. When spending time with horses, it’s clear we can never be in complete control of most things. However, we can learn to develop resilience and to be able to take command of what’s happening right now. We can respond to what is happening in a way that directs it more in alignment with our intention. So in a way, with the help of horses, we can learn to become more responsible, empowered and effective in what we project – a skill which will certainly turn helpful in the concert hall. I started realizing the extent of this energetic communication with my own horse Diora. In our time together, Diora and I had settled into a deep level of connectedness and presence. When I verbalized requests to her (e.g. “trot,” “canter,” etc. ), she would respond accordingly, directly after my verbal requests. When I tried to direct ‘thought requests’ coupled with distinct feelings to her, I noticed she’d also respond correctly, without my verbal cues. For instance, when I intended to start a trot, I’d “be” the trot and send the feeling of it to her, much like we sent feelings of appreciation to the horses in our study. From a place of alignment of thoughts, feelings and intentions, I could direct her walk, trot, canter, stop and reverse all at liberty with no halter or line on her. This was a powerful revelation in how connected we all are. Quite the horse whisperer, to put it in commercial terms. Whether we are aware of it or not, our presence, awareness and intention have the power to influence our perceptions and relationships. Horses are particularly sensitive and responsive to this type of mindful interaction. Learning to take responsibility at this level is very self-empowering. And that’s the helpful part of working with horses.